Fender Custom Shop as just announced the release of the "Limited Geddy Lee 1972 Jazz Bass. The bass has a suggested retail price of $8,000. "The Custom Shop has meticulously replicated every detail in neck shape, wiring, pickups and more in creating the Limited Edition Geddy Lee Jazz Bass, including the wear and tear of nearly 35 years of touring." For more visit Fender.com. - Thanks to Rushisaband for the headsup! The first show of this final run had been scheduled for July 24 in Calgary, but just a few weeks earlier that city endured a massive flood. The arena we were supposed to play in was underwater up to the tenth row. It was fairly certain we would not be playing that building, but rather than cancel our show, I suggested to the Guys at Work and manager Ray that we move it somewhere else, to higher ground—maybe outdoors—and play a benefit for those people who had lost so much. Everybody readily agreed, and Ray set about making it happen. It turned out that nowhere in Calgary itself was going to work, and the considered alternatives of Lethbridge, Alberta, and Kelowna, British Columbia, were rejected in favor of . . . Red Deer, Alberta. Rush: The Studio Albums 1989-2007 is now available for preorder, to be released October 1st. 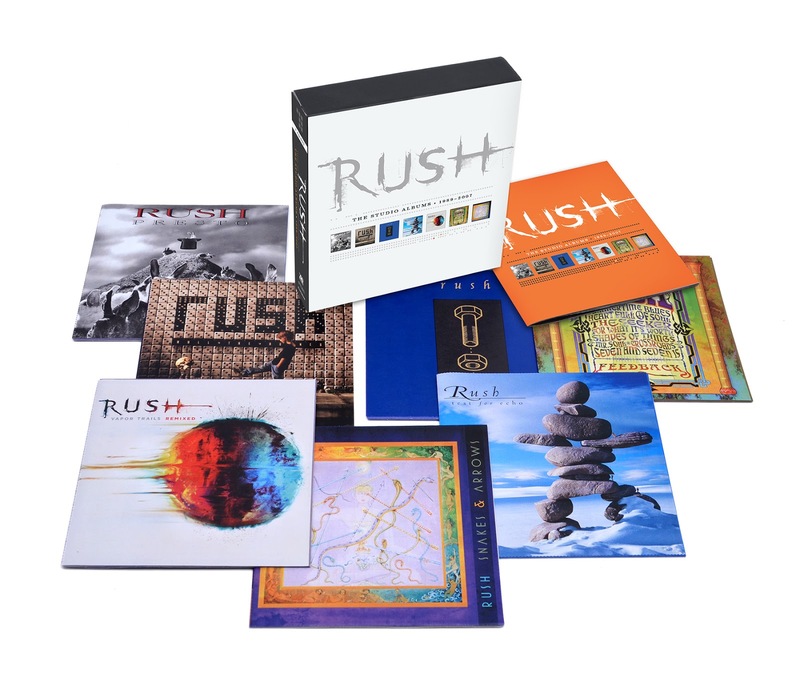 The 7-disc boxed set features every studio album Rush recorded for Atlantic Records presented in a wallet sleeve that faithfully reproduces the original artwork (except for Vapor Trails Remixed, which features a reinterpreted version of the original cover). Those that passed on the Atlantic Remasters when they were released in 2004 may be interested in knowing that The Studio Albums 1989-2007 box contains new CD versions of the six Atlantic albums newly remastered by Masterdisk's Chief Mastering Engineer, Andy VanDette, released last May digitally only on iTunes and HDTracks. The box also includes the all-new Vapor Trails Remixed, which is also being released October 1st as a stand-alone CD as well as on Vinyl and iTunes. This boxed set is Atlantic's complement to the Sectors boxed sets, which were also remastered by VanDette in 2011. Currently up for auction is an autographed 10" concert tom drum head last used during "All the Worlds a Stage" tour. Proceeds will benefit Mike Hesser, a self employed arborist who for the past two years has been dealing with some very serious health issues that is keeping him from working. This, unfortunately, has left him with no source of income or health insurance. He is now homeless and in desperate need of basic essentials to survive. Mike has been diagnosed with Fibromyalgia, which is a condition that causes long-term, body-wide pain, tenderness in the joints, muscles, tendons and other soft tissues. The pain then spreads out from these areas to include the back of the neck, shoulders, lower back, hips, shins, elbows, and knees. Mike also suffers from lesions throughout his body, which he is currently going through extensive testing at the Florida Department of education vocational rehab center. As of now, doctors have not yet been able to determine the cause. The auction ends August 25th. - Thanks to Dean Bobisud for the headsup! For sale: copies of Neil Peart's books "Masked Rider", "Ghost Rider" and "Traveling Music", each with a personal, hand written message to Peter Brockbank on the inside cover from the author. Peter Brockbank has known NEP since 1971, and narrated many of their adventures together in the "Legends Of Brocklehurst" (a nickname given him by Neil). Any doubts about these being genuine will be dispelled by one to one contact with any interested person; if interested send an email to brockbank192@hotmail.com. The Clockwork Angels soared a Mile High on Friday night, as the Rush tour finally visited Denver after 11 months on the road. We were there, and here are photos of the show from photographer John Vinson taken exclusively for Power Windows. John has been shooting Rush for nearly 30 years - you may remember his photos from A Show of Fans and The Spirit of Rush fanzines! Click here for the Photo Gallery of Rush At The Pepsi Center, Denver, Colorado, August 2, 2013! A DW Super Solid snare drum signed by Neil Peart, Jim Keltner and Doane Perry is currently up for auction on eBay with all proceeds going to benefit the Hospice of Santa Barbara. Neil Peart's signature is accompanied by a message reading Best wishes to everyone!. The bidding starts at $2500 and the auction will run through this coming Friday, August 9th. For all the details and to place your bid go to this location. - Thanks to RushIsABand for the headsup! The 2013 leg of the Clockwork Angels Tour kicked off April 23rd in Austin, Texas, and will conclude August 4th in Kansas City, Missouri. Here are the latest news and reviews. 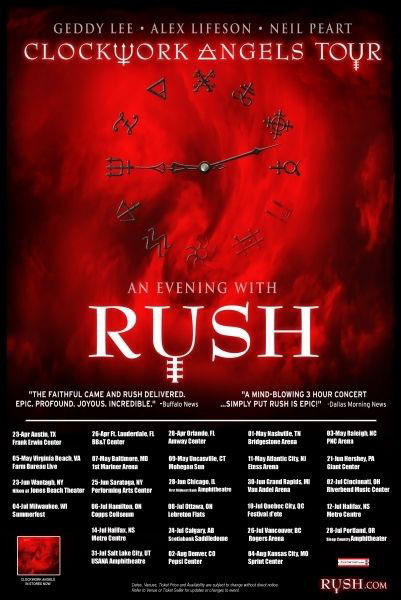 For spoilers, including setlists, photos and videos, visit the Clockwork Angels Tour News page. UPDATE: The limited edition Clockwork Angels 22" ride cymbal is now available for purchase at MusiciansFriend for $549; the original 22" Paragon ride goes for $369. While quantities last, Sabian will offer a limited release of the Neil Peart 22” Paragon Steampunk Ride and the Chad Smith 19” RHCP-Edition Holy China in North America only. 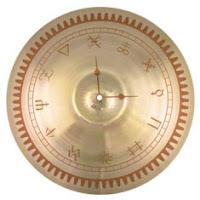 The cymbals will be well-known to fans of Rush and the Red Hot Chili Peppers alike – they received a huge burst of fan attention during both the Rush “Clockwork Angels” and the Red Hot Chili Peppers “I’m With You” Tours, during which SABIAN social media sites were inundated with fans asking where to buy the unique graphic models. As a result of the huge demand, SABIAN will produce a limited run of 300 of each cymbal in 2013 for Canada and the US. Although both are current production models, these cymbals are printed with an original, eye-catching graphic, and each one is hand-numbered under the bell and packaged in a deluxe custom bag with certificate of authenticity. Cymbals will be available for purchase later this month. Thanks to Mark Rosenthal for the headsup! Tomorrow before Rush's show in Denver, Coohills Restaurant will be hosting a preconcert get together across the street from the Pepsi Center at 1400 Wewatta Street. Chef Tom Coohill is a huge fan, and will be offering drink specials including a special 2112 cocktail. In addition, Tom has just penned the article "Why Rush Is My Favorite Band", which will appear in tomorrow's Denver Post. - Thanks Tom for the headsup! As part of their "Gateways To Geekery" series, today the A.V. Club posted "An introduction to Rush, the biggest cult band in the world". A thoughtful and truthful report, the A.V. Club has published a road map that attempts to set any new or young Rush fan well on the way to become a full fledged fanatic. The Newly Remixed Version Of Vapor Trails And 7-Disc Boxed Set Of Atlantic Studio Albums. In 2009, two tracks from VAPOR TRAILS (“One Little Victory” and “Earthshine”) were remixed for the Retrospective III collection, setting you all into a frenzy in anticipation of a possible remixed version of the entire album being released one day. That time has come. 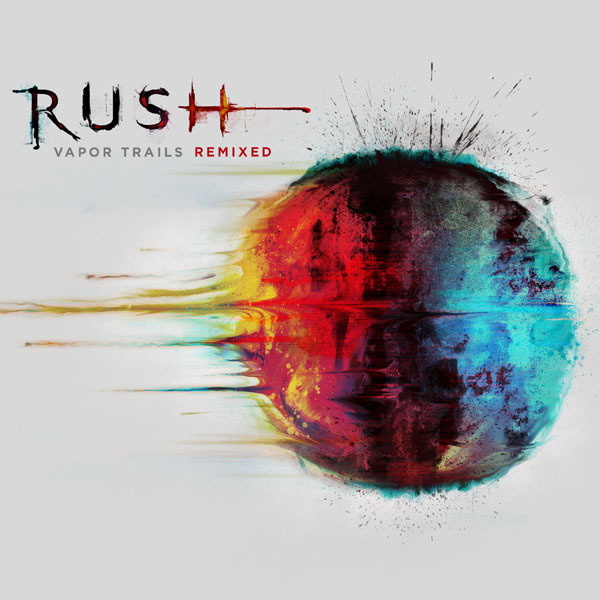 “Vapor Trails was an album made under difficult and emotional circumstances – sort of like Rush learning how to be Rush again – and as a result, mistakes were made that we have longed to correct. David Bottrill’s remixes have finally brought some justice and clarity to this deserving body of our work,” says Geddy Lee. "The band had recently been overseeing a remixed version of our Vapor Trails album, from 2002, as we had never been happy with how it turned out." "So...It's late in Los Angeles and I'm just listening to the 1st mastering job by Andy VanDette at Masterdisk of Vapor Trails, a great underrated record by Rush that I finished re-mixing a few weeks ago. This record was written and recorded just after, and about a time of great tragedy, and there were times, I'm sure, where it was uncertain whether the band would ever record together again. I just have to say how proud and grateful I am to have had the opportunity again to work with such creative giants. Please...if you are a fan, or even if you are not, give this new version a chance as I think you will appreciate it for its raw emotion, clarity of purpose, and cathartic appeal. 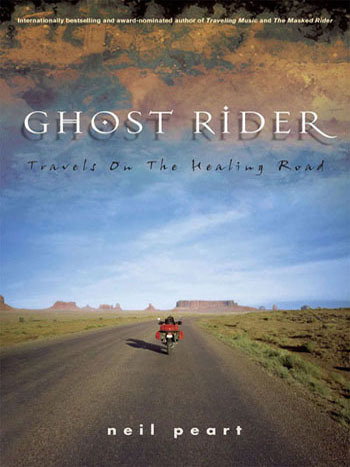 For those who don't know the story, just check out 'Ghost Rider: Travels On The Healing Road' by Neil Peart."